Gold Filled Cap with gold filled clip, with pattern of lines in groups of 3 all around the cap. This is the same unique pattern later used on the all gold filled aerometric Signet. These caps were found a 1947 dated double jewel barrel. Note the vacumatic rotary pencil, which would make it impossible to use a later cap from a “clicker” Signet pencil. Gold Filled caps with gold filled clips. Line pattern of group of five lines tapering up to one point near the clip, repeating all around the cap, and cap band with “Parker”. Gold filled content at bottom of cap. These caps have deep engraved lines unlike the later aerometric series tapered line caps. Gold Filled caps with 14k solid gold clips in “window pane” pattern. Model was sold as “Heritage” by Parker. Line pattern of horizontal and vertical lines throughout the cap, and cap band with “Parker”. Gold filled content at bottom of cap. Solid Gold 14k caps with 4 circles going around the cap and 14k clips. This was the new solid gold pattern introduced for the plain arrow clip in 1947. Model was sold as “Heirloom” by Parker. Pattern carried into the aerometric series. Parker Vacumatic Demi Sized Lustraloy (stainless steel) caps with chrome plated clips. These caps had a matte finish with a shiny cap band when new. Finish was more “brushed” than the later aerometric series caps. The finish did not stand up to wear too well and quickly wore off. This was a unique sized cap introduced for the Demi “51” in 1947-1948 with no Blue Diamond guarantee. One of only two patterns available. Gold Filled Caps with plain arrow gold filled clips, with pattern of closely spaced lines all around. Note the “Parker” on the bottom of the cap, over the line pattern. This was a unique sized cap introduced for the Demi “51” in 1947-1948 with no Blue Diamond guarantee. One of only two patterns available. Canadian-made Sterling Silver caps with chrome plated clips, lined pattern with chevron band. This combination of Sterling Silver with the plain arrow clip was only available in canadian production, around 1947-1948 for the vacumatic pens. These caps all had a rhodium plating to prevent tarnish. The finish did not stand up to wear too well, often wearing inconsistantly, and can sometimes be found with an uneven, unattractive appearance. In addition, the soft metal is very prone to dents and dings, and finding caps in perfect condition is very hard. Rolled Gold Cap with gold filled clip. English made, ca. 1949. 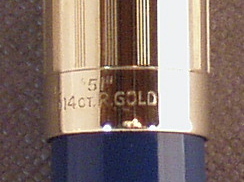 Pattern is groups of 4 lines and a wide space, all around the cap, with a wide cap band with “Parker” in the front and “51” and gold content on the back. Note the unique shape of the clip, common on english “51”s of the era. Parker Aerometric Full Sized Lustraloy (stainless steel) cap with chrome plated clip. These caps had a matte finish with a thin shiny cap band when new. Finish was more “brushed” than the earlier vacumatic series caps. The finish did not stand up to wear too well and quickly wore off. Available in both full and demi sizes. Parker Aerometric Full sized and Demi sized Lustraloy (stainless steel) caps with gold filled clips. These caps had a matte finish with a thin shiny cap band when new. Finish was more less “brushed” than the earlier vacumatic series caps. The finish did not stand up to wear too well and quickly wore off. Available in both full and demi sizes. Gold Filled Cap with 14k solid gold clip. Pattern is of horizontal and vertical lines forming “windows”. Sold as the “Heritage” model. This is the aerometric series version, where the “Parker” imprint is superimposed over the lines pattern, unlike the earlier “window panes” were Parker was on a “cap band” by itself. From the catalogs I have seen, it would appear that this was a very short lived model for 1948-1949. There was also a version made in the demi size, which is even harder to find. Solid Gold 14k caps with 4 circles going around the cap and 14k clips. This was the solid gold pattern introduced for the plain arrow clip in 1947 for the vacumatic “51” and carried over into the aerometric series. Model was sold as “Heirloom” by Parker. Note the “clicker” pencil, in contrast to the “rotary” pencil in the vacumatic series. Available in both full and demi size.